The storybook includes an audio CD with instrument tracks of two different tempos. Jose created a third set at 72 bpm to use with your students for practicing the rhythm patterns. Constantly assess your room and adjust to meet the students at their level, based on their prior experiences in your room. 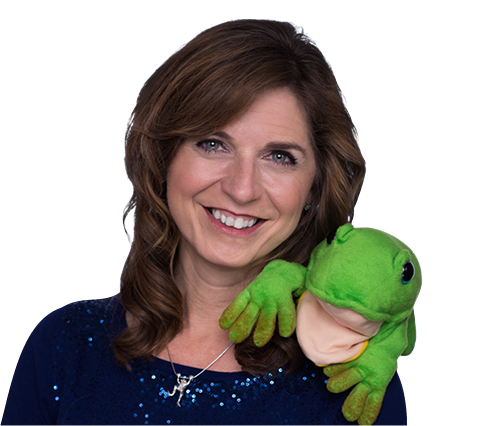 Freddie the Frog and the Invisible Coquí, is a fun way to introduce Latin jazz to kids. Latin jazz encompasses many styles. This story focuses on salsa. At the easiest level, focus on each isolated salsa rhythm pattern, learning and playing/performing each pattern in unison. Once secure and confident in keeping the salsa rhythm patterns, advance by adding one rhythm pattern at a time in layers. Use the rhythm section layered audio track as a guide and play along. Rehearse with body percussion before adding instruments. This lesson is written to only use body percussion. Lesson Plan 10 will add the instruments. 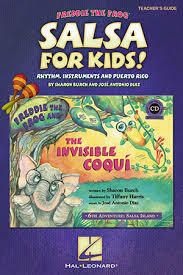 “Baila Coqui Salsa” on the Audio CD from Freddie the Frog and the Invisible Coquí. Additional details and lessons available in the teacher’s guide, Salsa for Kids! I can identify, hear, and move to salsa rhythm patterns. I can sing alone and with others. I can play alone and with others using body percussion. STEP 1. Silently point, asking students to find their assigned seat to sing Freddie’s hello song. TRANSITION: Freddie is so excited! SHARE, Freddie and Eli were exploring on their raft and ran out of drinkable water. They decided to stop at a nearby island to refill their water jugs and met invisible coquís who played music! Would they like to hear about it? STEP 3. Prepare for reading and interacting with the Freddie the Frog® and the Invisible Coquí story. Teach the rhythm patterns using body percussion. Use the mp3 audio files from Freddie the Frog and the Invisible Coquí to rehearse. Each instrument has a slow tempo track for learning and an uptempo track that matches the tempo used in the story. Chant and pat at a steady eighth note pattern on one thigh, representing a conga, alternating hands. Repeat until informally assessing the students’ ability to independently chant and pat the pattern. Chant and pat at a steady eighth note pattern on both thighs, representing bongos, alternating hands. Repeat until informally assessing the students’ ability to independently chant and two-finger tap the pattern. Chant and “scrape” or “paint” the rhythm pattern by holding one palm open and up; the other palm swishes, or “scrapes,” as though playing a guiro. The motion should be similar to painting the wall. Chant and pretend to shake maracas, alternating hands with the steady eighth note pattern. Chant and pat the pattern on both thighs, representing timbales, alternating hands. Repeat each instrument pattern until informally assessing the students’ ability to independently chant and pat the pattern. Play the slow instrument audio recording. Indicate students to softly chant and pat along with the recording. Play the 72 bpm instrument audio recording. Play the uptempo audio recording. The tempo matches the tempo in the story. TRANSITION: Ask students to stop and listen to the story. SAY, Be ready to tap the rhythm patterns with Freddie. STEP 4. Read the story, echoing with Freddie. Play the audio recording of the storybook while turning the pages, or changing slides. Silently indicate and model when the students should whisper chant and pretend to play a rhythm instrument with Freddie throughout the story. Congas: Co-quí plays and Fred-die dan-ces. Bongos: E-li likes to play the bon-gos. Guiro: Scrape, E-li. Scrape, E-li. Maracas: Fred-die likes to play ma-ra-cas. STEP 5. Teach the beginner salsa dance step. The basic salsa dance pattern is a six-step move. Chant the pattern that works best for you and your students as you learn the steps. Begin with your feet spread apart about shoulder-width. Step 1. (Beat one.) “One” or “Squish” – Move your left foot one step forward, and twist the ball of your foot, as though “squishing a bug.” The movement causes a natural thrust of the hip, part of the salsa movement. Step 2. (“And” of beat one.) “And” or “that” – Lift you right foot slightly off the ground and place it back down in the same place. Step 3. (Beat two.) “Two” or “bug” – Step back with your left foot past the original position. Step 4. (Beat three.) “Three” or “back” – Step back with your right foot slightly past your left foot. Step 5. (“And” of beat three.) “And” – Lift your left foot slightly and place it right back down. Step 6. (Beat four.) “Four” or “up” – Step forward with your right foot. After this last step you are ready to start the process all over again. Note: Although salsa rhythms are felt in two, it is easier to understand this dance explained in four. Play the Baila Coquí Salsa mp3 audio file and dance the salsa! Chant the dance steps while dancing until all students are secure in the step. Challenge: Sing while dancing the salsa! I wanna dance the whole night thru. Transition for leaving: Ask all students to stand and return to their assigned seat. Ask students to stand and turn in direction of the line. Follow the leader to the door to give Freddie a hug/high five and return to their classroom. More details on how to play the instruments, Puerto Rico, and coquis in Salsa for Kids!